The above image was in the latest Famitsu, and for any fan of the series, it teases at a rather scary prospect. Is the upcoming PS3 title going to be the final chapter of the Yakuza series? That being said, there’s something intriguing about the decimated and almost apocalyptic background of this image. Could this “End” just be the result of some attack on the city? That helicopter sparks images of war. Or could “The End” just mean a new beginning for the series? We’ll just have to wait for TGS to find out. Yas Noguchi, Senior Producer of Yakuza 4, chats about Yakuza. Perhaps now you’ll be become a dragon and not just be like one. 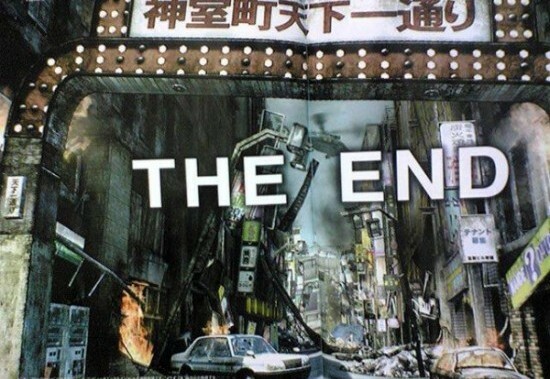 By the way, didn’t Nagoshi say that he wasn’t ending the series until fans lost interest? Oh man I hope it’s not the end. I JUST got into the series. I’m barely into the second game. The scene does not look like a typical scene you would see in Yakuza. In fact it looks like a disaster movie. My guess is a character in the game is watching television or a movie. I can’t see Sega killing off Yakuza being that the series is big for them in Japan. It would be interesting to see a major disaster happen in Yakuza. We’ve had a giant explosion in like every game so far. And the area the game takes place in has become so iconic to the series that destroying it could be a great way to signal a new beginning. With the PSP game having so many playable characters, we could even see a shift in a main protagonist. I just hope it’s not some Uncharted-style genre-shift that happens. It works sometimes in film, but I have yet to see it fit well in a game. The more I looked at the image I kept thinking about Resident Evil. Then I thought about horde modes. Maybe this is like and alternative universe type of minigame. It has no relation to the actual game’s story but is a what if scenario and you have to run around fighting the undead with nothing but fist, bicycles, signs, and other objects in the world. Or that’s just a terrible idea and I should have kept it to myself.